BUENOS AIRES, Oct 5 2018 (IPS) - Rural women play a key role in food production, but face discrimination when it comes to access to land or are subjected to child marriage, the so-called affinity group on gender parity within the G20 concluded during a meeting in the Argentine capital. The situation of rural women was one of the four themes of the Women 20 Summit (W20). 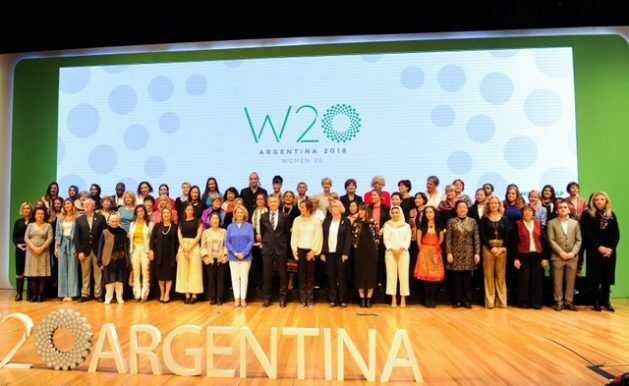 Women 20 is one of the seven sectors of civil society operating in the context of the G20 (Group of 20), which brings together industrialised and emerging countries and which this year is chaired by Argentina. The mission of these affinity groups is to make recommendations to the main world leaders, who will meet in Buenos Aires for their annual summit from Nov. 30-Dec. 1. However, in a day of private meetings and two days of public exhibitions on women’s rights and gender issues, held Oct. 1- 3, peasant and indigenous women were conspicuously absent, during debates on the invisibility of rural women and their role in development. The summit’s panels, held in the majestic former Argentine Post Office, were dominated by politicians, representatives of NGOs, officials of international organisations and managers and CEOs of companies. The closing address at the summit was given by Argentine President Mauricio Macri, who received the document of W20 recommendations, debated over the space of seven months by 155 delegates of the different countries, which identifies the major challenges that must be addressed for their strategic value as a motor for sustainable development. 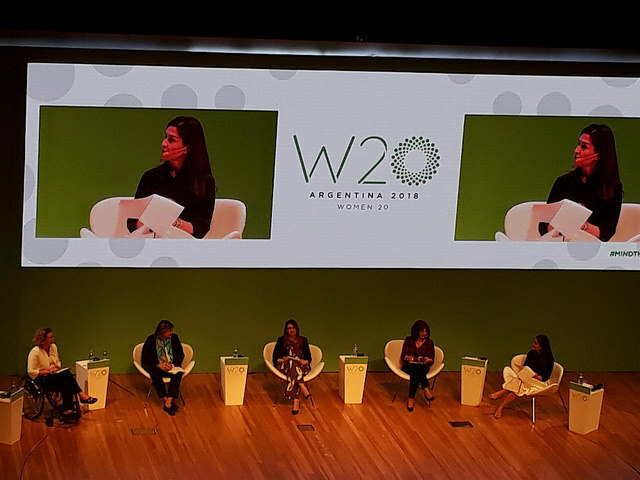 “The W20 summit exhibit programme did not represent the diversity of the women’s group that discussed the statement,” said Natalia Gherardi, executive director of the Latin American Team for Justice and Gender (ELA) and one of nine Argentine delegates who participated in the debate. “Evidently it had more to do with giving a place to the heads of the companies that financed the workshops,” she told IPS. Simultaneously, a group of women members of the so-called Feminist Forum against the G20 demonstrated nearby “against the neoliberalism of the W20 businesswomen”. The summit was held at a complex time for Argentina, with social problems arising from the recent strong devaluation of the local currency that accelerated inflation. To overcome the crisis, Macri sought the help of the International Monetary Fund (IMF), which imposed a drastic austerity programme to reduce public spending and the government itself admitted that poverty has grown in recent months and will continue to do so. “These meetings are to raise awareness about issues that could later become public policies. It’s very important to talk, because before it wasn’t talked about,” María Noel Vaeza, director of the U.N. Women’s Programme Division, told IPS. In the case of Latin America, the greatest urgency is to “eliminate child marriage. In rural areas there are girls who are married at age 12 and then drop out of school because they have to take care of their children,” said the official of the United Nations agency that promotes gender equality. The situation of rural women and girls was also the focus of this year’s 62nd session of the United Nations Commission on the Status of Women, held in March in New York. In the case of the W20 document, it called for the promotion of economic participation and inclusion of rural women in decision-making, through the allocation of funds to strengthen cooperatives and enterprises and promote access to credit. In addition to rural development, the other three themes of the W20 were labour, digital and financial inclusion. “The world leaders should look at the policies of their own countries and see the ones that are needed to be changed,” said Lilianne Ploumen, a Dutch politician of the Labour Party and member of their country’s parliament. “If rural women had the same rights as men, there would be less hunger in the world,” she said. “The lack of infrastructure in rural areas affects them disproportionately. And new problems, such as climate change, affect them more, because they are more vulnerable,” said the expert of IICA, an organ of the Organisation of American States (OAS). According to data released by the W20, rural women make up more than one-third of the world’s population and 43 percent of the agricultural workforce. Most of them work in family-owned enterprises and do not receive any payment for their work. When they receive it, the amount is on average 25 per cent lower than what men are paid. One of the central issues is education, and it was recognised that approximately two-thirds of the world’s illiterate people are women living in rural areas. The issue of land ownership was also brought up, because globally women own less than 30 per cent of the land, although the situation varies greatly from country to country. Another critical point is access to sexual and reproductive rights: the pregnancy rates among young women living in rural areas are three times higher than those living in cities.